Into the Woods starring Meryl Streep and Emily Blunt, reviewed. Great cast. Great score. So why is Rob Marshall’s adaptation so lost in the woods? 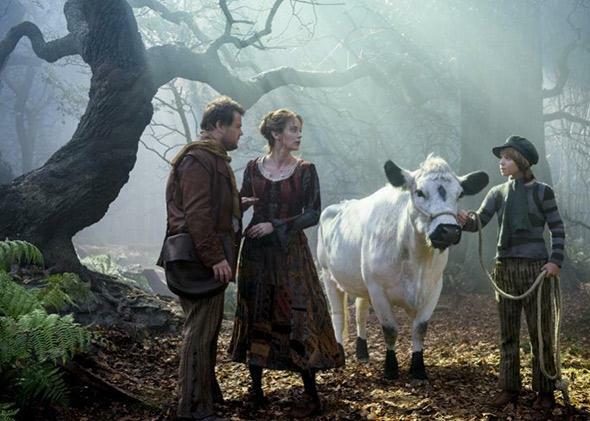 James Corden, Emily Blunt, and Daniel Huttlestone in Into the Woods. Rob Marshall’s lushly mounted but inert Into the Woods opens, like Stephen Sondheim and James Lapine’s 1987 stage musical, in grand and promising fashion, with the words “Once upon a time.” The complex title number weaves characters from several different fairytales—Cinderella, Red Riding Hood, and Jack (of beanstalk-climbing fame)—into a new story about a baker (James Corden) and his wife (Emily Blunt) longing in vain for a child. The tone set by this song establishes that this version of these classic stories will be an irreverent, unsentimental, and sometimes dark-tinged one: “Into the woods to bring the bread to Granny who is sick in bed,” sings Red Riding Hood (Lilla Crawford) jauntily as she skips toward the forest. “Never can tell what lies ahead—for all that I know she’s already dead.” But nothing about this opening number—or indeed the whole first half of the movie—prepares the viewer for the steep dive into irredeemable bleakness the second half will take. That rapid descent from hope to (near) despair is, of course, built into the Sondheim/Lapine show. Into the Woods is an adult inquiry into the promises of childhood fairytales; in essence, it’s a musical that asks, “What happens after ‘happily ever after’?” At the time of the show’s original Broadway run in the late ’80s, the pitch-dark second act—in which, let’s just say, bad things happen to good people—read to many audience members as a metaphor for the AIDS crisis. (“The trouble with fables is everyone looks for symbolism,” Sondheim has responded.) But the stage version of Into the Woods—a two-act play in which the second act examines the unsettling moral implications of the first—has a dramatic shape and a moral wisdom that this rushed and thematically murky adaptation lacks. That’s in part because of significant cuts and condensations that the filmmakers have chosen to make (the screenplay is adapted by Lapine from his own book). For starters, two key characters—including the fourth-wall-breaking narrator—have essentially been eliminated, as have the last song of the first act (“Ever After”) and the first song of the second (“So Happy”)—essentially, the two numbers that bookend the premature happy ending and its rapid dissolution. Without any formal transition between the first and second halves of the story (and without the dramatic structure furnished by these and other missing songs), the play’s 180-degree reversal of tone midway through goes from subversive to simply confusing. That first half, though, has some treats to offer. After Red Riding Hood has embarked on her journey to Grandma’s, the infertile bakers are visited by a witch (an enjoyably scenery-gnawing Meryl Streep) who promises to lift the curse she placed on them years ago if they can bring her a few precious items. This magical scavenger hunt becomes the device that brings the disparate plotlines together, as the baker and his wife head into the forest to score Jack’s cow, Red Riding Hood’s cape, Cinderella’s shoe, and, eventually, a ropey braid of hair snatched from Rapunzel (Mackenzie Mauzy), who’s been imprisoned in a tower by the witch. Meanwhile, Cinderella (Anna Kendrick) outsmarts her smarmy stepmother (Christine Baranski) and makes it to the royal festival—but she, too, flees into the woods, where she’ll cross paths with the rest of the characters in a roundelay of seductions, negotiations, and betrayals. Here’s where I should confess I’m not the Stephen Sondheim–head some musical theater fans are. Though I always admire this composer’s twisted way with a lyric (and consider “Send in the Clowns” to be an essential of the American songbook, as beautiful interpreted by Bernadette Peters as it is by Krusty the Clown), I generally prefer my musicals with less recitative-style sung dialogue and more catchy, beltable melodies. This version of Into the Woods features a few showstoppers, even if, for me, they usually hit more because of the performance than the song. Chris Pine and Billy Magnussen, as two frustrated princes, rip their shirtfronts open in a frenzy of competitive suffering in the amusingly hammy duet “Agony.” (Not to beat a dead horse about ill-conceived cuts from the stage show, but that song sadly loses the second-act reprise that’s one of the highlights the stage version.) And as the indecisive Cinderella, Anna Kendrick gets to showcase her clarion soprano and trademark self-deprecation in a solo sung while stuck in tar on the steps of the palace. Meryl Streep doesn’t quite have the vocal control of Kendrick or Emily Blunt, both of whom make impeccable musical-theater heroines. (Blunt almost out-charms Kendrick, which takes some doing.) But Streep has always been able to put over a song like nobody’s business, as she proves in a melodramatic but wrenching mid-movie ballad, “Stay With Me,” about the pain of a parent letting go of a child—a song that sets up the themes of loss, grief, and resilience that come to dominate the second act. In fact, the whole cast (with the possible exception of Johnny Depp, who’s a little too in love with himself in a shticky one-song cameo as the Big Bad Wolf) does a solid-to-excellent job. But there’s a vast gulf between the plotlines that are fun to follow (for me, Blunt’s, Kendrick’s, and Streep’s) and the ones that aren’t, so that the film’s energy keeps rising and falling from scene to scene. The tedium of Into the Woods’ second half has less to do with the downbeat subject matter than Marshall’s clumsy direction. When the tone shifts from buoyant to grim, Marshall (who directed the Oscar-winning but, to me, airless 2002 screen adaptation of Chicago) seems to lose control of the pacing and tone, packing in multiple CGI-heavy climaxes that feel too familiar from the recent run of fairytale-inspired blockbusters (Snow White and the Huntsman, Maleficent, and more). Grit-enriched fairytales are having a major cultural moment (in part, perhaps, because of the precedent set by Into the Woods’ success), which may help account for why this material feels less fresh than it might have in 1987. But the bigger problem is that after the (insufficiently demarcated) break, Marshall seems to lose the thread of what Into the Woods is meant to be about. Instead of being a rueful meditation on the inevitable disappointments of adulthood, the last act plays out as a generic dystopian bummer. There’s a “junior version” of Into the Woods, designed for performance in schools and by children’s theater companies, that leaves off the entire second act (as well as trimming some of the harsher material from the first). We should be grateful, I guess, that in adapting the material Disney at least tried to reproduce the decidedly adult developments of the play’s second act, rather than simply lopping off the scary stuff and offering up the first half as heartwarming family fare. (Especially given the studio’s proprietary interest in many of the characters in question.) Still, I’d head to Grandmother’s house over the holidays with a different suggestion in your basket—maybe, if Granny’s game, the original Broadway production, starring a sublime Bernadette Peters and currently streaming on Amazon.